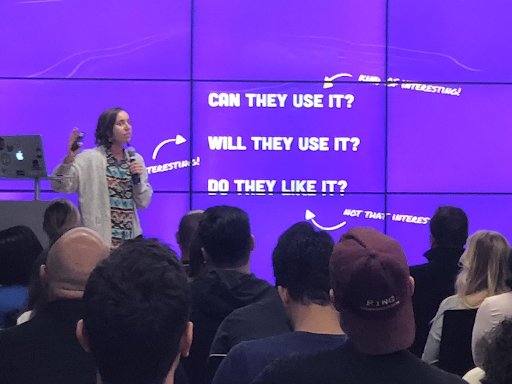 There’s a growing community of researchers and designers in Los Angeles who are interested in using customer research to build the best products. Ethnio is supporting the community by hosting casual events for UX researchers, designers, and anyone interested in the needs, motivations and behavior of our users. We met in Santa Monica in August, and then headed east to Pasadena to the ADP Innovation Lab. There was a series of short talks, plenty of food and drinks, and Q&A. This was an interesting point raised by an audience member during the Q&A. 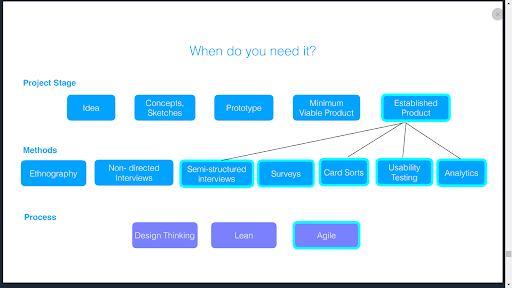 Why do we need to do UX research? Isn’t usability testing enough? Besides, how do we measure a return on investment if we do conduct UX research? Companies focus a lot on usability testing for their interfaces, but user research is way bigger than that. It’s about talking to real people about their real problems by knowing when to apply different research methods in the product’s life-cycle and measuring how it positively impacts your business. The speakers unpacked and spoke about their experience in addressing this. She also showed how 60% of the top 10 reasons startups fail is directly related to lack of UX research. When it comes to when to use research methods, it depends on what phase of the project you’re on (design research techniques is a good resource) and Gloria gave her version on it as well. Lex Roman, previously a Product Designer at Invision, currently Growth Designer for The Black Tux, spoke about customer development where one actually talks to real people about their real problems to see if they will use the product rather than if they like it or if it’s usable. She mentioned Steve Blank as a pioneer for this term. Her steps to do customer development are to find the target users and go to where they are. Then talk to them about their problems or situation and seek opportunities. She uses Ash Maurya’s problem interview style to ensure identifying unsolved opportunities. As we build products, it’s important to keep an open channel with these customers to learn how our solutions are addressing their problems. JonDelina Buckley, UX Strategy & Research at ADP, spoke about measuring the outcome of UX research on the company, not just the end-user. This return on investment, or ROI, of UX was discussed by an Alan Cooper and Jared Spool post she shared and also showed how AirBnB, IBM, Amazon, and McAfee had measured the impact of their UX research efforts. 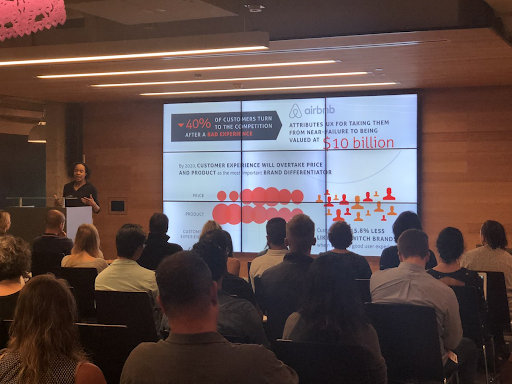 The way she was thinking about it at ADP was to translate metrics to UX efforts and then connect those to company KPI’s (key performance indicators). Using the business model (or lean) canvas can help you describe the rationale of how an organization creates, delivers, and captures value. My own experience with human-centered design approaches and methodologies are that they are in the pursuit of asking questions ultimately intending to expose the essence of the human condition. For me this means creating solutions from user research that enable a genuine impact – not only for the business but for the products people use every day. This research challenges my own perceptions, biases, values, and promotes empathy in understanding underlying problems, making it possible to contribute to designing and developing products that fit intuitively into people’s lives. It also allows me to be dedicated to the problem and to see how individual projects fit within the broader product strategy and goals so we can measure how it positively impacts the business. Talk to real people about their real problems by conducting UX research that combines empathy, pragmatism, and creativity to hunt for opportunities in a particular situation. Validate those ideas to create intentional solutions that ideally improve people’s lives. Paying attention only to metrics like revenue and operating costs undermines your team’s effort to focus on the problems that matter most to users. Have an understanding of appropriate user outcome metrics that help you to learn and to understand user behavior. Ethnio – Platform for UX research recruiting, scheduling, and incentive payments. Bluebeam – Powerful construction design and management software. Grace Lau – Incredibly dedicated to growing the community of researchers and designers in LA.